Tomokazu Harimoto continues to revel in front of the home crowd in Kitakyushu after the Japanese teenage star successfully added his name to the line-up for the Seamaster 2018 ITTF World Tour Lion Japan Open Men’s Singles final with a fine display against fourth seed Lee Sangsu (11-5, 10-12, 11-4, 11-5, 5-11, 11-9) on Sunday 10th June. 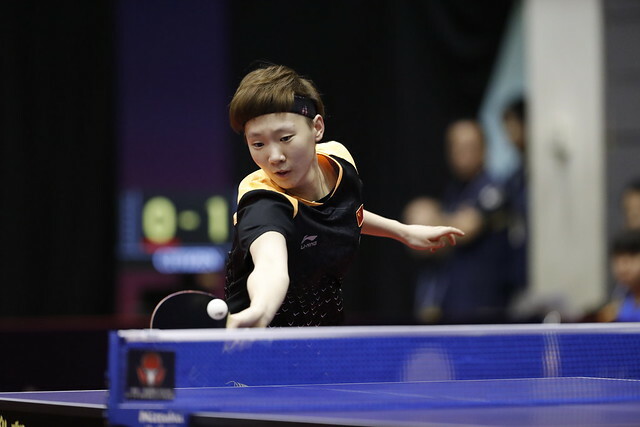 Earning his spot in the last four with an amazing effort against last year’s Champion Ma Long, 14-year-old Tomokazu Harimoto was just as impressive against Korea Republic’s Lee Sangsu one round later. Demonstrating his trademark battle cry with every point won, Tomokazu Harimoto moved three games to one ahead but faced a late charge from his Korean counterpart who pulled a game back to take the match into a sixth game. Leading 9-7 on the points scoreboard, Lee Sangsu looked set to force a decider but four points in a row in the other direction saw Harimoto confirm his place in the final. Unfortunately the other semi-finals fixture didn’t go ahead with Timo Boll withdrawing from the tie due to injury problems. Seeded first in Kitakyushu, Germany’s Timo Boll announced that signs of a neck issue he originally picked up back at the 2016 Olympic Games were beginning to return in Kitakyushu and subsequently decided against risking further injury paving the way for China’s Zhang Jike to move through to the final by default. Tomokazu Harimoto does battle with Zhang Jike for the Men’s Singles title later in the day.